We walked into a "Five Guys" joint in Newburgh, NY yesterday - and walked out after less than 15 seconds. The place stunk of stale oil and was noisy, noisy, noisy - not because of the customers - there were very few. The noise was from a platoon of employees whooping it up behind the counter in their ugly red uniforms. I wonder what keeps the Five Guys in business? There's better hamburgers in the same plaza from Chilis and Longhorn Steak house. We went to a quiet clean Panera next door - complete with fresh air and the pleasant aroma of baked goods. I had a small bowl of tasty black bean soup and a ham and cheese sandwich on excellent rye bread ( the ham and cheese were , at best, only OK - standard commercial sliced ham and dull american cheese, but the mustard was a nice spicy variety). John, your experience mirrors mine - some Five Guys franchisees hire below-average FF-type help. Your food will probably not be cooked very well, either. The franchisor doesn't seem to be doing anything about this. 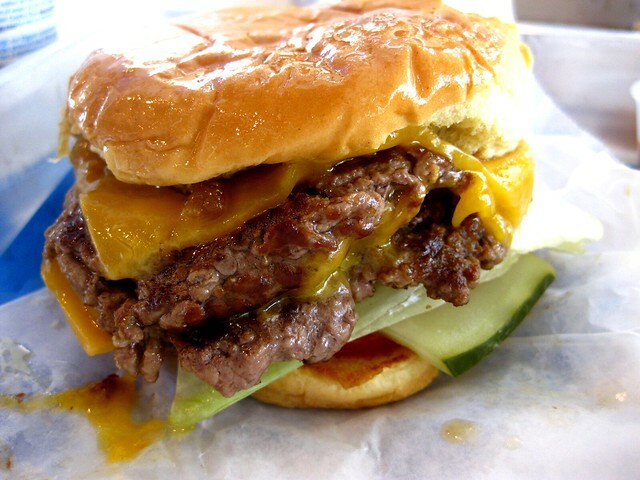 Some franchisees do turn out a great burger for the price, however. Its hard to tell if Five Guys will survive in that shopping center. However, with burgers at about $8-9 at Longhorn with a tip required, A meal at Five Guys will be about 40% less. They are successful because they are in the middle of cheap mega-hamburger chain burgers and moderate-priced casual restaurant burgers. This plaza is kind of interesting. It is new - about 2 years old- and is located at the intersections of I-87, I-84, and two major local state highways, and near Stewart International airport. However, because of the very complex interchanges there, it is not "easy off-easy on", nor is it easy to get into or out of the plaza onto the local roads. Theres a huge new diner type restaurant, a pizza joint, Five Guys, Longhorn and Chilis all in the same plaza - a lot of competition. There is a chain motel also there which, I suppose, would be helpful to food purveyors. I actually had a decent burger at Five Guys recently. Long layover at Reagan(DCA), and Five Guys was voted the lesser of all dining evils in the terminal. They were very busy, and the girl cooking the burgers only pressed them once, as opposed to continually flattening them to a crisp. The result was a juicy, tasty burger. One other note. I ordered my burger with fried onions, raw onions and jalapenos. Assuming the jalapenos would be pickeled. They were thick, raw jalapeno slices. Not tasty at all. The stewardesses must have loved you after that meal. "Stewardesses"??? Bill you're showing your age !!! Joe, hate that happened to you! Fresh jalapenos have their place but not on a Burger! Or... on a Nacho! Or as a topping for any Chili dish. I've been to a couple 5 Guys in the Portland area. I liked the burgers and so did my son. They just opened one up in the Syracuse area, went there last week. They're not bad, I just don't think the burgers lived up to the hype. For half the price, I can get a burger twice as big and tastier down the street at a local bar. I kind of liked the fries better than the burger. I love raw jalapenos on burgers as well. The earthy intensity that they bring makes them a perfect compliment to a burger. I guess this preference falls into the same category as the preference of fresh mushrooms vs pickled/canned mushrooms as a pizza topping. In most cases I will always take the fresh version of a vegetable over the canned. I'm not allowed to give particulars but 5 guys is almost constantly secret shopped. They are well over 5 pages of questions that have to be answered after doing a shop there. I think they are very concerned about the franchisee following the original concept which spells everything out in the most minute detail. There has been a LOT of push back from consumers as 5 Guys has started an aggresive expansion into the surrounding states. The original concept, the original group, and the original stores are what made 5 Guys legend. But from my experience some of the people they are allowing to represent them are failing at upholding that noble tradition. I think that the DC area Five Guys are better than anywhere else...probably since Five Guys started in the DC area. I still like Elevation Burger a bit better though. Wow! Another Five Guys thread. When this started I was "defending"; now I am laughing. In the latter part of the Reagan Administration I often patronized their first location, a walk-up with no seating, a few doors down from Brenner's Bakery which baked their buns. Then, I hated their loud music and being served in a poke. But, I loved their food. Over the years I have enjoyed their success and wish I had loaned them a hundred grand or so "back when". For all the "nay-sayers" on these threads I can only point out that the "Guys" are a hit in NYC. I hope Paris is next, then Rio. A few years ago they came to Dallas and were were forced to compete with a total rip-off of their "concept", right down to the colors, ambiance, serving line, website, and menu: Mooyah's. Now, for the first time the Guys will go head-to-head in the same market as In-N-Out right here in the Big D. Having eaten at both I know where this will work out. In the meantime I dream about the "Guys" being at Metro Charles Michel and the 3000 block of Av. Atlantica. I hear that we're finally going to get a 5 Guys that is geographically sane. With all this talk I might have to give it a try. You'd think the Los Angeles area would have been saturated by now but it seems our rent is too high. The LA 5 Guys is going to be in Culver City. That Elevation Burger looks mighty good. Too bad that they're not in the midwest yet, but hopefully that will change in the near future. Bob went there a couple of weeks ago and thought it was pretty good. I like my hamburgers thick and cooked medium rare. If I want two miniscule patties beaten with a stick, I'll get a Mickie-D's and avoid the line. Miniscule????? And I have never seen violent cooks beating the burger...I see quality fresh, not frozen, burgers grilled ...and to compare a 5 guys burger to Micky D's...certainlyt not taste -wise...believe and like what you want...but I think that comparison is way out of line!!! Very good point. Five guys are certainly not the best burger but the comparison is not accurate or correct. I have been to Five Guys several times. Their burgers to me personally on a scale of 1-10 are somewhere around a 6 while the fast food places are more like a 3. Their fries are certainly better than the fast food joints and certainly much more generous. Way more than two of us can consume. I do not go out of my way to enjoy a Five Guys but if they are close, I will stop in. I do not consider them fast food as they have always cook to order when I was there. Fuddruckers have the best condiments by far. They also cook to order. Comparing 5 guys to mcd is imo ridiculous. Having said that I think the $10 I spent the other day on the 5 guys "small burger" fries and and a drink was also ridiculous. A VERY noisy crowded place with someone shouting out in a voice loud enough to carry across town ORDER 52. ORDER 53 and so on. The food wasn't all that either but I was glad they had malt vinegar for the fries. I have to add this also. I get paid to eat there and I doubt I would ever choose them otherwise. I can see why Five Guys has been voted one of the best chain restaurant burgers.......they're good. But their fries are REALLY good. And you get more than plenty of them. Yes, it must boil down to the management. The Five Guys locations here are excellent and do a land office business. I've nerver had a bad burger, the fries are a standout, and I'm known far and wide as Mr. Picky. (Not crazy about their bun, but it's not as bad as Wendy's new cake of desert dust.) Nearest location is about 10 miles away, and I'd eat there more often if they were closer. Word I get from California friends (also picky as *&^!!) is that In-N-Out edges them out. Had both...In N Out is a much better fast food burger than the standard...nut if memory serves,perhaps 5 Guys was a bit better. Certainly their fries were better...and I too wish 5 guys had a hartier roll,,,or the option to add a Kaiser roll!! Lucky me living in Big D! IN-N-OUT and Five Guys will soon have stores within four miles of each other and only 8 miles of us in McKinney, TX. The Guys' store on Spring Creek & Central in far North Plano is already open; IN-N-OUT's Allen store on Stacy & Central will be opening soon. #$^%-ing paper plate if I'm sitting down and turn down that loud music! I've had these complaints about Five Guys ever since patronizing their first store (NE corner of Glebe & Columbia Pike in Arlington, VA) back during the Reagan Administration. That store was a walk-up only, so pokes and foil were necessary. But, they no longer are. How about doing a side by side taste test when both are open, and report back? ?